Though determinedly microcosmic, she was never minor. 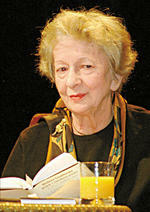 Szymborska takes on an onion, and that onion is peeled, down to its essence. A Szymborska poem is always charming, wonderfully charming, charming as a small child singing, charming as a great pop-song lyric. The magazine was circling the drain, at least in part because we decided to try to be more like The Economist. Surprisingly to no one, that failed miserably. That’s because there’s only room for one weekly news magazine that people claim to read but don’t. We should have kept doing what we had been for nearly 80 years: being the magazine people read but didn’t go around bragging about. The shift to the market has created a new dynamic. The relationship between testers and test subjects has become, more nakedly than ever, a business transaction. Guinea pigs are the first to admit this. “Nobody’s doing this out of the goodness of their heart,” Miller says. Unlike subjects in later-stage clinical trials, who are usually sick and might enroll in a study to gain access to a new drug, people in healthy-volunteer studies cannot expect any therapeutic benefit to balance the risks they take. With all the celebrations over the last six months, you might have thought Charles Dickens’s 200th birthday had been and gone. Not so. Tuesday is the day and it is now too late to read those novels you promised you would when everyone first started talking about it. But it’s not too late to read the digested read versions of three of his finest books, Great Expectations, Bleak House and David Copperfield, at guardian.co.uk/books. Both in the UK and in the US, we observe puzzling gender asymmetries in the propensity to outmarry: Black men are substantially more likely to have white spouses than Black women, but the opposite is true for Chinese: Chinese men are half less likely to be married to a White person than Chinese women. We argue that differences in height distributions, combined with a simple preference for a taller husband, can explain a large proportion of these ethnic-specific gender asymmetries. Blacks are taller than Asians, and we argue that this significantly affects their marriage prospects with whites. I decided to figure out what French parents were doing differently. Why didn’t French children throw food? And why weren’t their parents shouting? Could I change my wiring and get the same results with my own offspring? Has Obama in office been anything like the chess master he seemed in the campaign, whose placid veneer masked an ability to think 10 moves ahead, at which point his adversaries would belatedly recognize that they had lost long ago? Or has he been revealed as just a pawn—a guy who got lucky as a campaigner but is now pushed around by political opponents who outwit him and economic trends that overwhelm him? Cognitive entanglement, after all, is the rule of life. My memories and my wife’s intermingle. When I can’t recall a name or a date, I don’t look it up; I just ask her. Our machines, in this way, become our substitute spouses and plug-in companions. It’s hard to imagine any greater disconnect between public good and private profit: the interest of private prisons lies not in the obvious social good of having the minimum necessary number of inmates but in having as many as possible, housed as cheaply as possible. No more chilling document exists in recent American life than the 2005 annual report of the biggest of these firms, the Corrections Corporation of America. Wasserstein failed to improve the company’s performance, failed to meet its obligations to creditors, screwed its workers, and still made a profit. That’s not exactly how capitalism is supposed to work. The lesson of Building 20 is that when the composition of the group is right—enough people with different perspectives running into one another in unpredictable ways—the group dynamic will take care of itself.